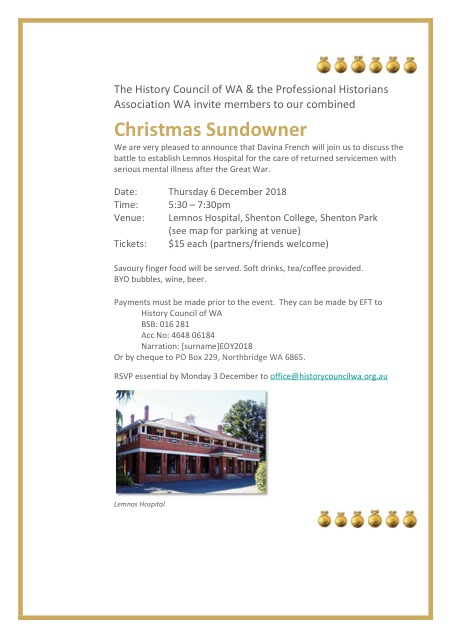 The History Council of WA & the Professional Historians Association WA invite members to our combined Christmas Sundowner. We are very pleased to announce that Davina French will join us to discuss the battle to establish Lemnos Hospital for the care of returned servicemen with serious mental illness after the Great War. Savoury finger food will be served. Soft drinks, tea/coffee provided, BYO bubbles, wine, beer. Or by checked to PO Box 229, Northbridge WA 6865.